I am happy to be able to discuss a non-Meaningful Use (MU) issue in this letter. Despite the challenges of MU and a plethora of Health Information Technology (HIT) challenges, the Clinical Support Services (CSS) team continues to work on ways to improve the provider experience within the GE Centricity Electronic Medical Records (EMR). Many clinical departments have already seen these enhancements as forms and flow sheets tailored to specific clinical workflows. An EMR enhancement that has been developed, taking into account provider recommendations, as well as data showing the most used document types is the “Provider View”. This view will remove the clutter of documents between each visit type or phone note. The hope is that this view will make finding documents much easier, and reducing scrolling through non-provider specific document types during a patient encounter, or when reviewing charts. MU – this folder will be kept as a holding spot for future MU-related documents. 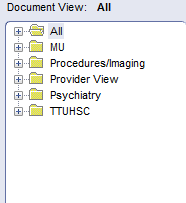 Since this is an attempt at improving the experience within the EMR, I welcome any comments or suggestions on how to improve it with more, or less document types, and potentially different folders that may simplify working within the EMR, without adding too many folders to make it meaningful. The Clinical Visit Summary continues to be a focus of attention for MU (“Provide Clinical Summaries for Patients for Each Office Visit” for 50% of all office visits). We continue to work with GE on a fix to improve the amount of unnecessary information within the CVS. Once this is available CSS will inform everyone. The Patient Portal continues to have increasing number of patients signing up. These are exciting times as we enter a patient-driven era of Health Information. I would encourage all providers and clinical staffs to remind their patients to utilize the Patient Portal – www.myttpelpaso.org In the future increased patient portal utilization will help eliminate or reduce the need for paper in our clinics.